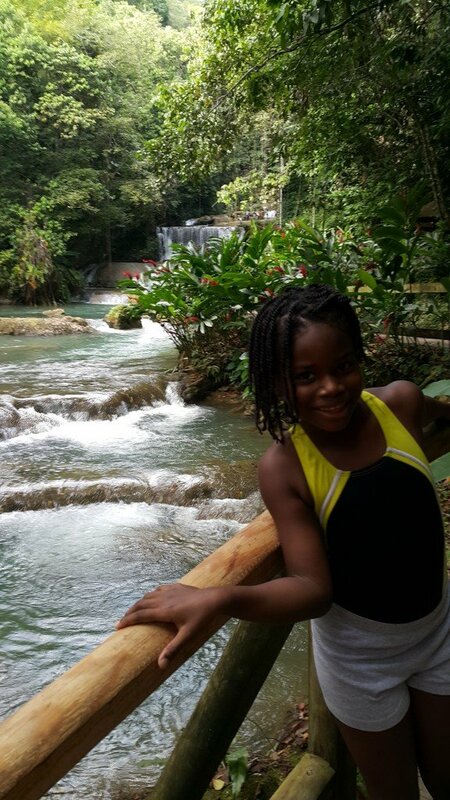 YS Falls is on Jamaica’s South Coast and one of the most beautiful cascading waterfalls on the island. It’s not as famous as Dunn’s River Falls but it should be! 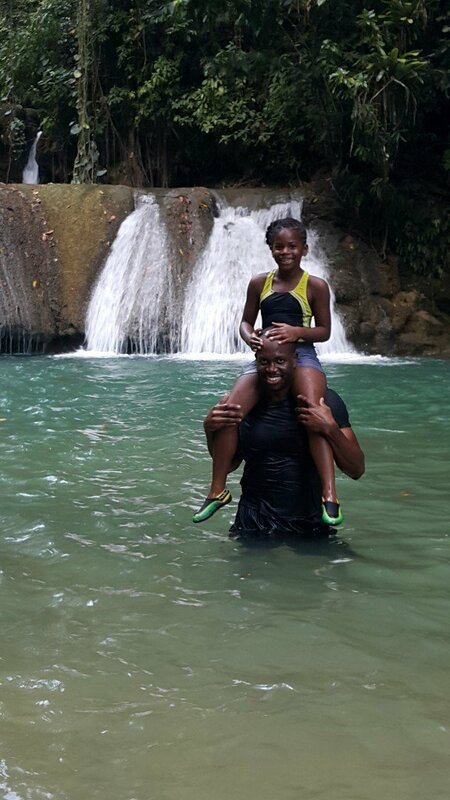 It is a shame that I have only been there once but it was memorable enough to make it on my top 5 list of things to do in Jamaica! 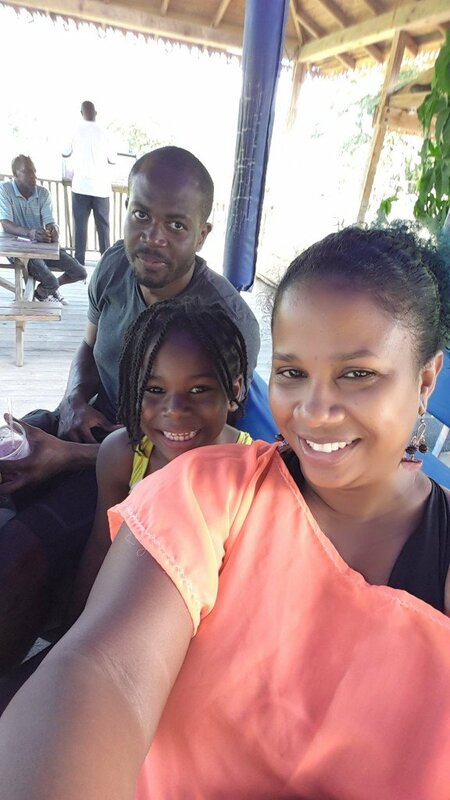 There’s a lot to do in the parish of St. Elizabeth but this is arguably the best attraction that the parish boasts. 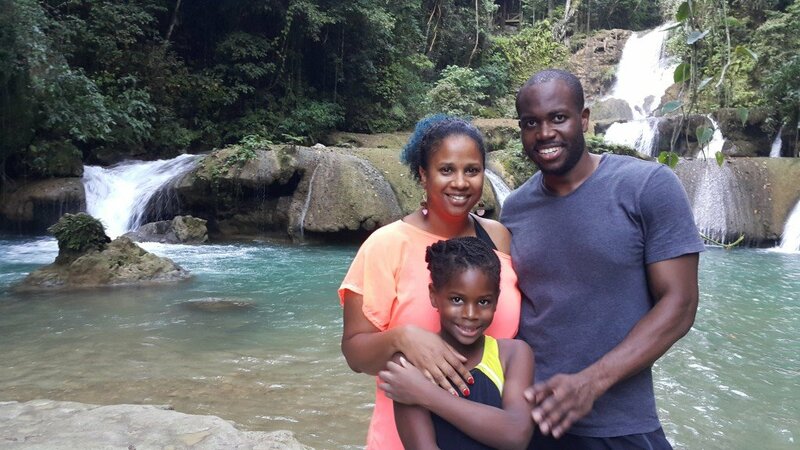 Getting there takes a bit of a drive as the waterfalls are far inland in the hilly interior of Jamaica. St. Elizabeth isn’t close to any of the major tourist areas so gear up for a bit of a ride. The road gets a little bumpy but the scenery is gorgeous and you’ll be able to enjoy lots of Jamaica’s culture and coastline along the way. The property that this attraction sits on is absolutely amazing. It is expansive, lush, green, and breathtaking. You can make it an all-day adventure with varying things to do on property. 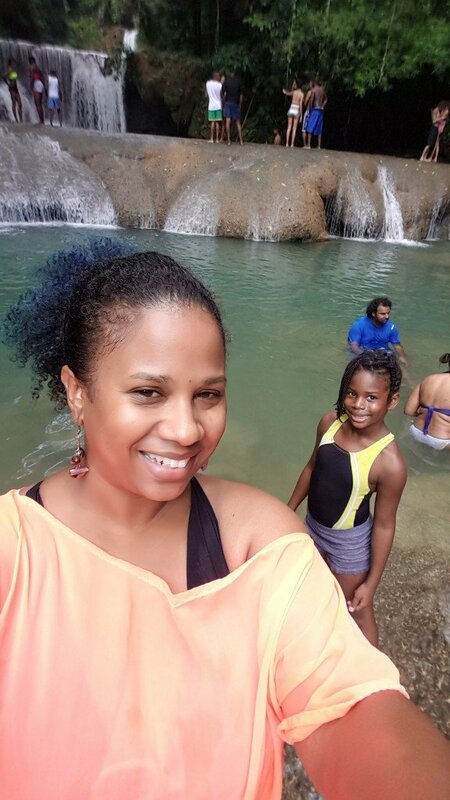 They offer river tubing, horse-back riding, ziplining and ATV tours of the property plus there are several pools both man-made and in the river itself for you to swim in. The grounds are large enough to accommodate family picnics and games. 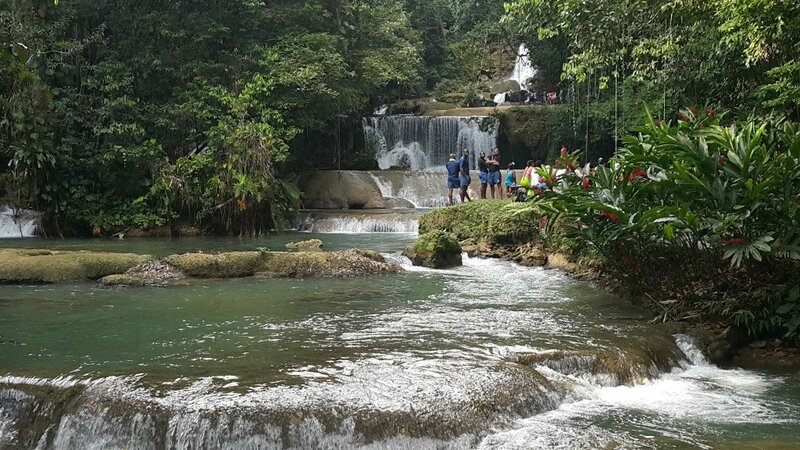 Upon arrival at YS Falls, you’ll take a tram up to the waterfall and activity area. The ride takes you along the riverside and some of the farmland complete with a stud farm and horses roaming the property. The falls were beautiful. Tiered and toppling, I couldn’t wait to dive in. 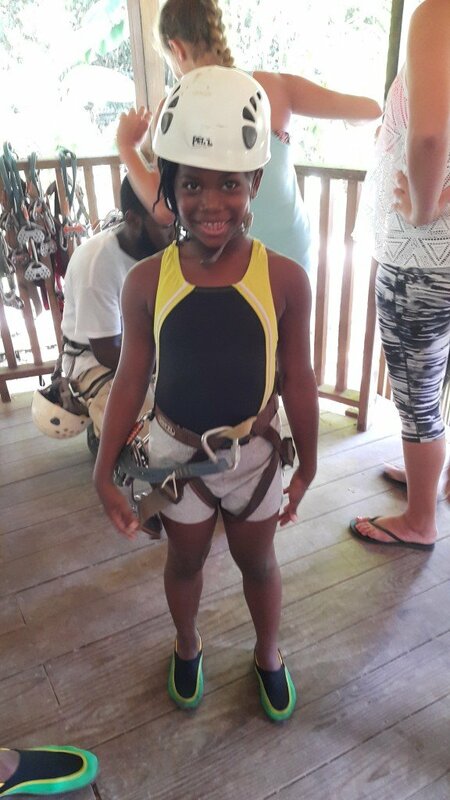 But first, zipline. I’m not sure why I thought my five-year-old scaredy-cat would even think of giving it a try, but after seeing her jump into the Blue Hole several times I thought she had grown some baby balls. The higher we climbed the steps to the top of the zipline, the more she whimpered. 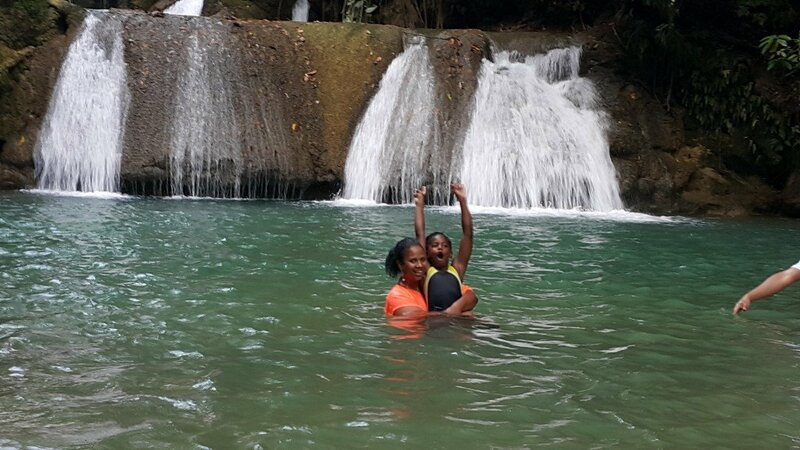 Then we finally got to the top of the falls, she hollered so bad. Her dad had to take her back down to the base. I went first and tried to hold it in so she wouldn’t see me hollering, scared shitless when I went off, trying to be brave. This was my first time ziplining and down below didn’t loo so welcoming! The very first line was a little tame, just enough to get your feet wet I assume. 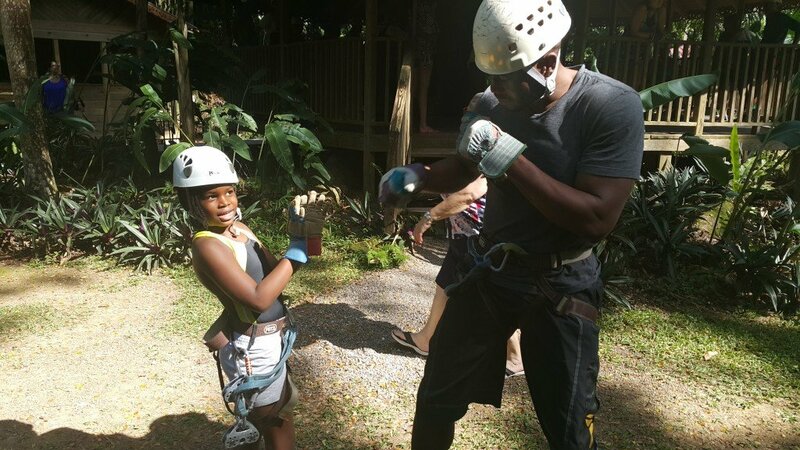 The longest line on the zip line trail was as fun as it was scary! And that was only the middle line. By then I was ready for it to be over! Tip: never go with a huge group, too much of a wait time in-between each zip line. Wait until smaller groups are going for a much more fun and exhilarating time doing line after line. 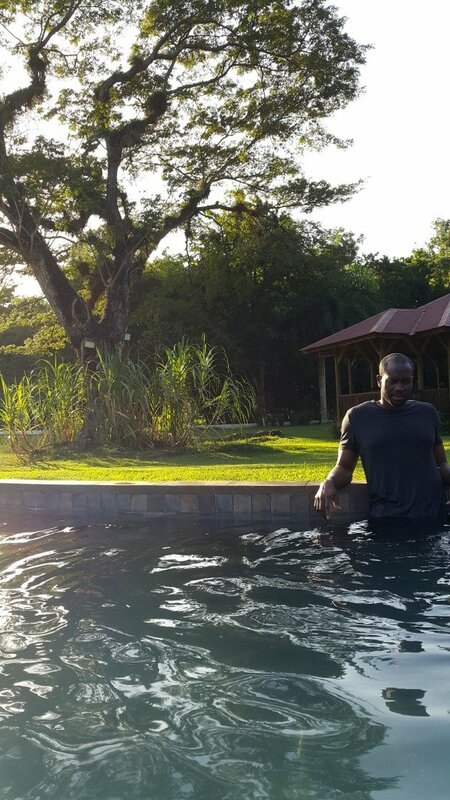 After the zip line, we spent some time swinging from a rope into this pool. This is munchkin celebrating after a successful swing in. YS Falls Postcard. Isn’t this picture perfect? I must get it framed. (Update, I did!) We moved on to explore a couple of their shallow pools around the property after all th excitement. I even supported their gift shop. Got some rasta-coloured earrings and an oversized Jamaican-painted mug. The prices weren’t as gougey as I expected for a tourist destination. You can bring snacks to have around the property since the restaurant is all the way out at the front before you get on the tram. Health enthusiasts will be happy to know that the restaurant offers up delicious vegan treats along with Jamaican favourites such as jerk chicken.